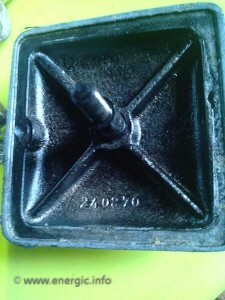 Common problem with the Motobecane S Bloc engines used in the Energic motoculteur C7 and D9 models. 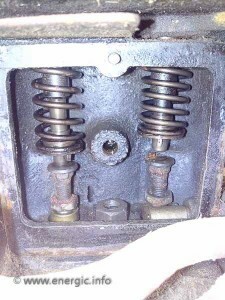 Remove the valve cover by unscrewing by hand the ridged oversize outer screw head. (check the seal). Originals where cork based but new modern material can be used. Energic motoculteur moteur motobecane valve stuck open. Photo from Energic motoculteur C7 S bloc. Just un cease the valve stem, by working right to left with WD40 or other release penetration agents. Could use penetration oil gently tap spring pin stop from right to left and back again. 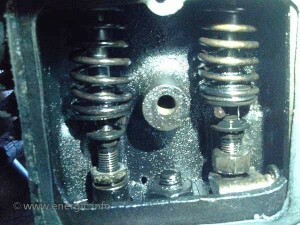 Photo from Energic motoculteur D9 S bloc. Shimmy discs can be used to pack worn valve stem bases. Also to aid compression and timing. Thus keeping the valve stem in contact with the push rod at all times. 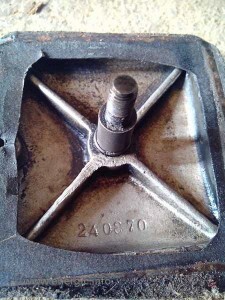 Removing the valves, and re-seating after grinding the engine head surface, will give a better tight fit to the valve and aid compression. The De-coke!